The Pan & Tilt unit EXPTC010G is made with strong Anticorodal aluminium, die-cast alloy of AISi 7Mg EN - AB 42000 group. EXPTC010G is equipped with a germanium viewing window designed for thermal imaging camera installations. The germanium window composition has remarkable properties and covers transmission from 7.5 to 14μm IR range with the best optical quality. All external components are stove enamelled. 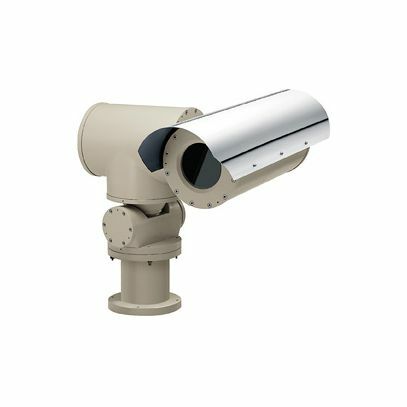 The system includes a housing with the same characteristics of the EXHC000G and a Pan & Tilt, designed for movement both horizontally and vertically. The peculiar characteristic of the device is the absence of external wiring in rotation, either for the control of the Pan & Tilt or for the camera and lens. This solution makes the installation and the maintenance of the Pan & Tilt easy. One multi-conductor cable comes out from the base of the Pan & Tilt through a cable-gland. The EXPTC010G is supplied with preset, auto-pan and housing heater and optional sunshield. The P&T functions are controlled by the EXDTRX telemetry receiver.